While I was picking up half price green finds at the Salvation Army store, I also spotted a couple of lovely items that weren't included in the sale. Let me just say, I don't know much about the value of things when I'm shopping at thrift stores. I am not buying to resell, so I just buy what I like, as long as it seems like a bargain to me. I liked the rustic charm of this wire egg basket, above, but I wasn't sure if I should bring home something quite so rusty. I decided to go for it. I can't quite remember how much it cost, but I believe it was under $2. I did some research since then and found out that similar egg baskets are priced at $30 or more. 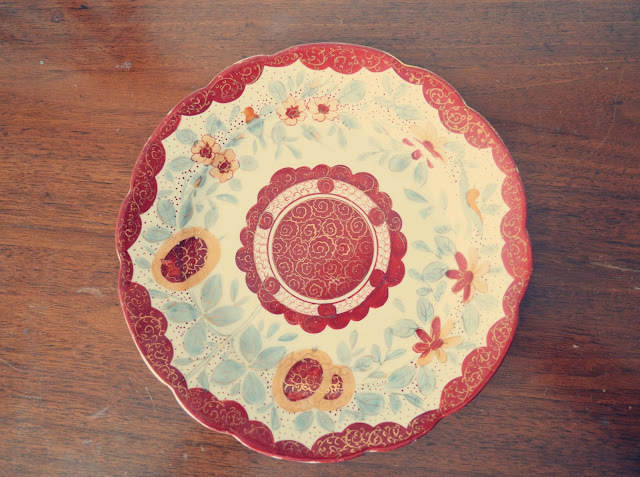 I also found this pretty plate that I can use to photograph some of my What I Ate Wednesday foods. 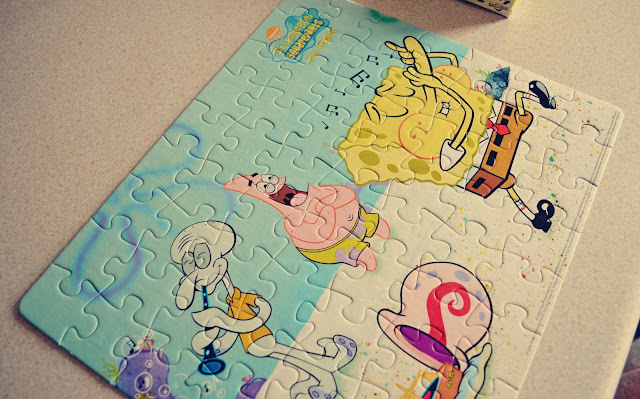 I spotted this SpongeBob puzzle, still sealed in the box, and thought it might be fun for the kids. It was also half price because there is green on the box. I'm glad I bought it, because my daughter immediately put it together. 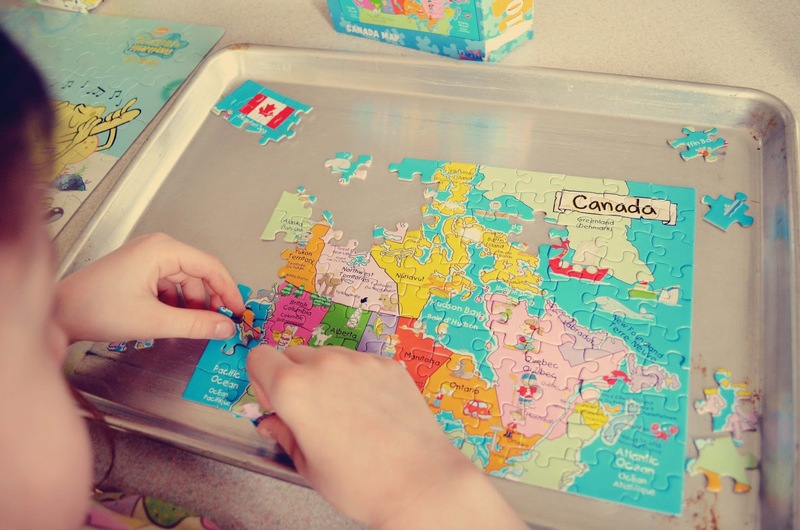 Then she headed down to the games cupboard in the basement and came back with this Canada puzzle. Then she headed back down and returned with this 500 piece chocolate puzzle. Her brother even joined in on that challenge. I'm always happy to see them do something other than watch television or play video games. When I saw this unused Scooby-Doo doll, still in the box, I thought it was really too childish for my kids. 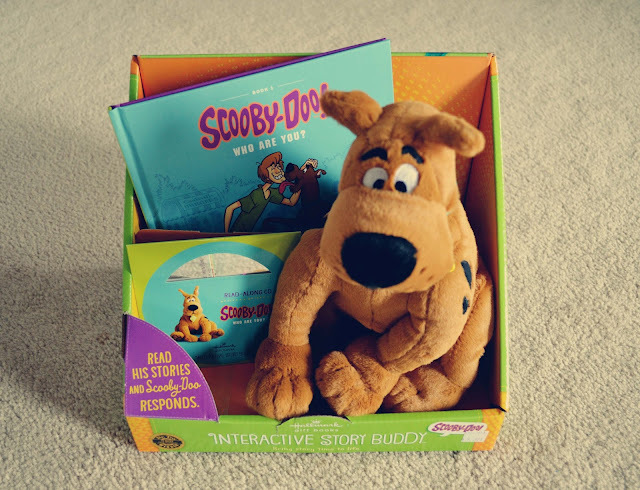 But we all love Scooby-Doo in this house, and this Scooby actually responds verbally when you read certain parts of the book aloud. For $5, I figured why not? As soon as the kids came home from school I read them the book and they loved hearing Scooby chime in. I kind of liked it myself. What was (or is) your favourite toy? I also really love the fact your kids enjoy puzzles.. As silly as it sounds, it seems like kids I know are ONLY into electronic sort of play. It's refreshing to see a classic puzzle is still entertaining! Yay on the egg basket! I keep looking at them, but I don't want to spend more than a few bucks, so good for you. Your daughter is a puzzle genius! This was the first time I ever saw an egg basket! I like your favourite toy. I keep telling my kids that's what we used to play with. ;) Cherry trees are amazing too. I loved our crooked apple tree growing up. 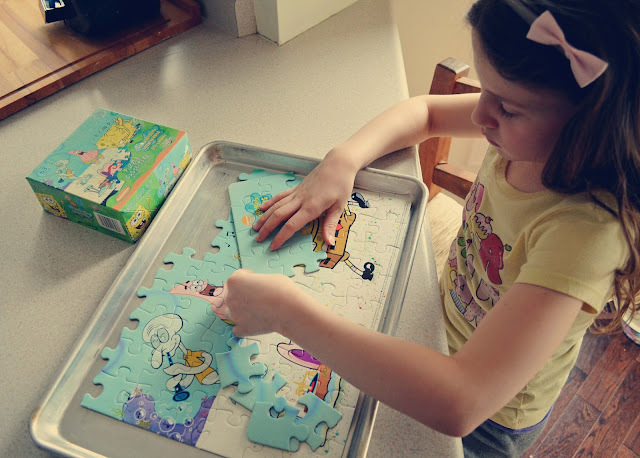 I like the way the kids do a puzzle - in a baking pan!! Love that egg basket. I recently just sold a similar one for $18.00! Your kids are the cutest! 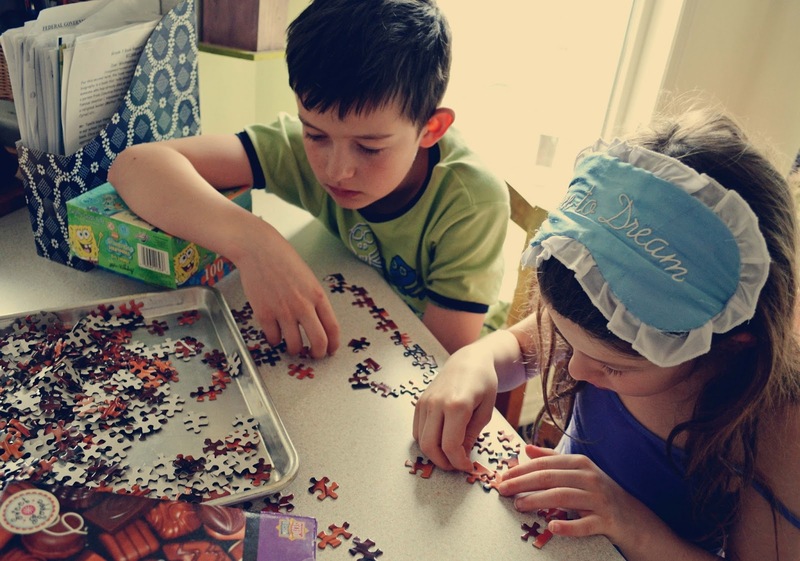 I love it that they would do a puzzle - we're puzzle people ourselves! Some fantastic finds! I havent been to our local thrift store in forever - time to get back out there I think. 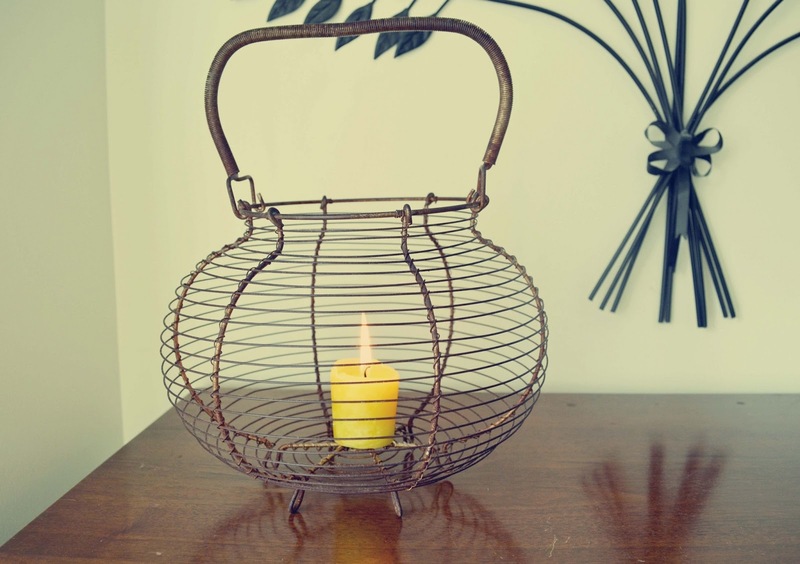 Very cool basket and plate! I have a hard time narrowing down my favorite toy. Whenever I thrift I am constantly looking for all of the toys that I played with as a kid (MLP, Rainbow Brite, Strawberry Shortcake, Old School Fisher Price, etc.) They all bring back such great memories!